Our speech and occupational therapists are experienced in working with children presenting with a variety of feeding and swallowing disorders. Comprehensive evaluation and treatment services offered. Feeding therapy is recommended if a child is having difficulty with any aspect of eating. This is common with children with special needs or medical challenges; however, it is becoming more prevalent in typically developing children. Children that have dropped food groups, have a very limited diet and stress over trying new goods, gag, or even throw up at the sight of food, or have limited oral motor skills are excellent candidates for feeding therapy. Does your child need a feeding evaluation? Click here to find out! The CAN-EAT approach, is a pediatric approach to feeding and swallowing. 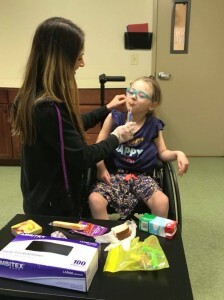 This approach uses medical, motor, and behavioral strategies to address feeding problems from coughing and choking with meals, poor oral motor skill acquisition, food refusal, food selectivity, oral aversion, pocketing food, and expelling food. The SOS Approach uses a transdisciplinary team approach which assess the “whole child”: organ systems; muscles; development; sensory processing; oral-motor skills; learning, behavior and cognition; nutrition and the environment. The SOS Approach focuses on increasing a child’s comfort level by exploring and learning about the different properties of food. The program allows a child to interact with food in a playful, non-stressful way, beginning with the ability to tolerate the food in the room and in front of him/her; then moving on to touching, kissing, and eventually tasting and eating foods (Toomey and Associates, 2017). Beckman Oral Motor Protocol is used to remediate and address difficulties with articulation, oral-motor skills, and feeding. This protocol uses assisted movement and stretch reflexes to quantify response to pressure and movement, range, strength, variety and control of movement for the lips cheeks, jaw, tongue and soft palate. The assessment and treatment is based on clinically defined functional parameters of minimal competence and does not require the cognitive participation of the individual. Because these components of movement are functional, not age specific, the protocol is useful with a wide range of ages and diagnostic categories (Beckman, 2018).